After I took part in a radio discussion last week on the positive aspects of bed sharing, following the publication of a study that provided evidence that co-sleeping was not only safe, but beneficial, I've decided to write a little more on the topic here. I've previously blogged about our own bed sharing experience. I'm forever trying to pursue an intuitive and natural parenting experience, that doesn't rely too heavily on "expert advice" (other than where clear, evidence-based safety advice is concerned of course) so for me at least, bed sharing is as natural as breastfeeding. I breastfeed, primarily, because I'm a human mother with a human baby and it's how nature intends me to feed her. Putting a baby into a cot feels to me as far removed from nature as feeding a licensed medicine in place of breast milk. I feel equally awkward about the fact that Seb slept in a cot as a baby five years ago, as I do about the fact that I fed him infant formula from birth. Babies are born with no concept of the country or century they're born in to. Like all mammalian babies, they're born reliant on their Mothers; for food, but also for warmth and protection from predators. Granted, in the UK, we're unlikely to have our babies snatched away by wolves, but a baby isn't born realising that - and the thought of being apart from it's Mother, the one person responsible for keeping it safe from said perceived wolves (or bears, snakes, tigers etc. ), is terrifying. There's a lot to be said for applying primal principles to parenting, and indulging a babies primitive understanding of the world it's born in to. If you asked a baby where it would most like to sleep, it would obviously choose to be against the warmth and familiarity of it's Mother, close to the breast, in the same way that most other mammalian babies sleep. That's the main reason that I bed share with Quinn. Guidelines dictate that babies should sleep next to their Mothers, but not their Fathers, without pillows or duvets etc. but their own blanket or baby sleeping bag. Babies should only bed share before 6 months if breastfeeding exclusively, and with parents who've not been drinking, smoking, using drugs (legally or otherwise), or who're excessively tired. Bonding - Co-sleeping has been shown to lower rates of maternal cortisol production in sleep, and increase the rates of oxytocin produced by the brain during the night, which plays a key part in creating the correct neurological pathways that would prevent a Mother from abandoning her child. Of course, improved bonding leads to an all round more positive parenting experience. Better breastfeeding success rates - Bedsharing has been shown to massively improve a Mother's chances of continuing to breastfeed exclusively to six months. This may be in part due to the neurological balance created by the reduced levels of cortisol and higher oxytocin, and the improved bond that results. More likely, however, it means that Mothers can breastfeed easier through the night without having to even get out of bed. Breastfeeding has many benefits to Mother's health, from eliminating her risks of non-hereditary breast cancers (where other lifestyle factors, such as smoking, are removed), to reducing her risk of osteoporosis in later life. For Mother's who really want to breastfeed, bed sharing is often a life saver (perhaps even literally). Reduced risk of PND - Breastfeeding itself has been shown beyond any reasonable doubt to significantly risk PND rates. There are a number of potential, and probably combined, reasons for this. One leading theory is that if a Mother doesn't breastfeed her baby for the first six months, the resulting lack of key hormones created when breastfeeding, causes the Mother's brain to believe that she has lost her baby. This makes sense, when you consider that many PND sufferers report being constantly anxious about their baby's safety and health, constantly checking that they're breathing, or worried that they're going to come to harm. For the same reason, Mothers and babies shouldn't be separated, the production of oxytocin throughout the night as a result of bed sharing, helps to maintain maternal mental health. N.B - breastfeeding and bed sharing only reduce, but do not eliminate, a Mother's risk of suffering from PND. More sleep - Perhaps the holy grail of early parenthood, all parents strive to get even a workable amount of sleep at night. Bedsharing babies tend to sleep longer, and Mothers who don't have to constantly get up out of bed to fetch their babies for every feed, feel less tired in the morning. All too often you hear a sleep deprived Mum say how she was up all night because her baby would only sleep against her, and would wake as soon as they were laid down in their crib. Just think how much more rest that poor Mama would get if the crib itself were removed from the equation! Saves money - If you're not lucky enough to have someone gift or loan you a crib/hammock/moses basket, you'll find yourself forking out for a bed that your baby will probably grow out of in a few short months. If I were to have another baby (I won't) we wouldn't bother with the infant sleeping thing. Quinn's Amby hammock was awesome, and for anyone who really wants a non-bedsharing option for a newborn, I'd point them towards the hammock every time, but retrospectively, we could have just coslept exclusively from day one and saved ourselves the money. Better sleep - Bed sharing babies benefit from a better quality of sleep which perfectly acknowledges their own, natural sleep cycles, lessening the symptoms of "over tired" babies. 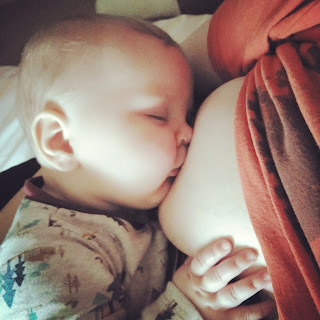 Better breastfeeding success results - No baby, other than perhaps a few with very severe allergies, would choose to be fed anything but breastmilk in their first six months. Every baby expects to be fed their Mother's own milk, and so anything that increases their chances of receiving that food is something that they'd get right behind if they could. Babies who bedshare are more likely to be breastfed for at least the first six months of their lives (often longer), significantly reducing their risk of infections, and reducing their risk of Sudden Infant Death Syndrome by over 30%. Breastfed babies are significantly less likely to be obese, in childhood or adulthood, and are less likely to suffer poor digestive health with diseases such as IBS. Promotes healthy brain development - Breastfeeding contributes some of the way towards optimum brain development, and these benefits are even greater promoted by bed-sharing alongside exclusive breastfeeding. Just as in their Mother, bed sharing means that babies brains produce higher amounts of oxytocin, and almost no cortisol, compared to those babies sleeping in their own cots, whose cortisol levels can become dangerously elevated during the night. High levels of cortisol can permanently impede brain development, whilst the more oxytocin pumping through a baby's system, the better, in terms of neurological health. Lower SIDS risk - Co-sleeping massively reduces a babies risk of Sudden Infant Death syndrome, which we know from extensive studies, is often a result of a baby simply failing to breathe, for no obvious reason - linked to their inability to adequately regulate their own breathing. Babies rely on their Mother's breathing pattern to regulate their own, and where they're removed from their Mum, and therefore from this benchmark for their own breathing regulation, they're at an elevated risk of stopping breathing whilst asleep. Unfortunately babies still die in unexplained circumstances when bed sharing, or sleeping in a cot in their parent's room, but we do know that being safe besides their Mum see's a babies risk drop dramatically. Unfortunately, as modern parenting practices see babies move in to various sleeping arrangements that don't mirror our natural instinctive desire to keep our babies close, SIDS rates continue to rise. Lower risk of injury - One of the biggest objections to bed sharing, is parents worrying that they'll roll on top of their children. This is the reason that it's recommended that baby sleeps next to it's breastfeeding Mum, and not Dad, and that only breastfed babies co-sleep. Breastfeeding Mothers have an incredibly advanced intuitive awareness of their baby's position in the bed, and the chances of a breastfeeding Mother suffocating or harming her baby in the night are unbelievably low. However, breastfeeding Mums who're having to get up in the night, to feed their babies in an upright position in the bed, or on a sofa, or in a chair, are more likely to fall asleep in these positions, presenting a high risk to baby, of suffocation, or being dropped. Breastfeeding Mums often report falling asleep whilst breastfeeding, and waking, terrified that anything could have happened to their child in their arms. Safely breastfeeding in a bed that is arranged for co-sleeping removes risks to baby.